Much like the excitement shown by Steve in Blue's Clues, I often get quite giddy over receiving mail. Well, maybe not that excited. After all, his song and dance about receiving new mail borders on disturbing. I used to order quite a bit of stuff over the internet and checking my mailbox would be like Christmas every day! Mixed in with little "self-gifts" were the usual pieces of junk mail that normally go straight to the recycling bin. However, there are times that I will take a look at the occasional waste of paper, especially those involving food (who would've guessed?). A particular one caught my attention a few months ago. 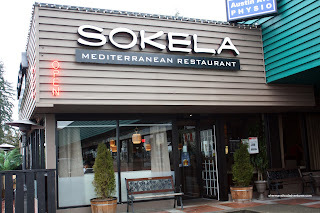 Advertising itself as an "upscale-type" Mediterranean restaurant, Sokela up on Austin in Coquitlam seemed like something different. Sure, there is an endless list of places I would like to visit. Yet, most of the time, my restaurant visits are based on convenience. Today, Pomegranate and I were passing right by Sokela and decided to go on a whim. Inside, it resembles your typical Earl's-Milestone's-Joey's decorated restaurant. That's not a bad thing by the way. We were greeted quite warmly by our server and she informed us about the daily specials. We decided to get a Calamari to start since it's one of Pomegranate's favs. 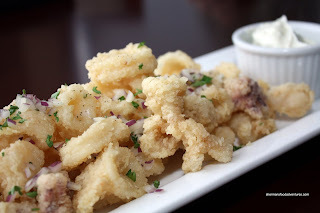 Arriving on a nice long rectangular plate, the squid rings were extremely tender with a crisp batter. We hypothesized that the squid could've been marinated in some lemon juice (?). The batter benefited from the use of starch, which is a trick used in Chinese fried items. We liked the tzatzki; yet it could've used a bit more zing. 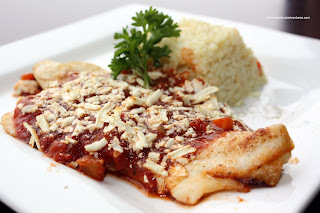 Attempting to be a bit healthier, I chose the daily fish which happened to be a Basa Fillet with marinara sauce and feta cheese. The fish was cooked absolutely perfectly. I was only moderately happy with the sauce because it tasted a bit thin and one-dimensional. By no means was it bad, it just could've been more varied in flavour. I really didn't like the rice, it was very soggy. Pomegranate went for something I'd usually choose - the Lamb Chops. These babies were amazingly tender and flavourful. Once again, we think that they must've been marinated in lemon juice and olive oil. We were quite happy with our meal at Sokela. Of course, much like anything else, it wasn't perfect; yet the proteins were cooked masterfully. oh, i was here last year for a friend's birthday last august! we got to sit out on the patio; nice :) our server was very attentive and the food was better than i had initially expected! Haha, yah it is clever! 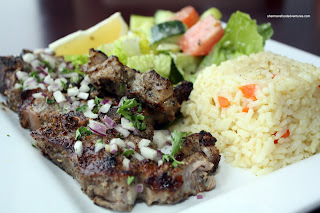 Yes, the food was decent, some components need a bit of work, but as I mentioned, the meats were done really well. Love the Calamari.